I hope you enjoy this article by Stewart Squire on the 1st of Motobu’s Two-Person drills. I’m really grateful to Stewart for allowing the article to be poster here as I feel it makes a very nice addition to the website. PS You can find details on Stewart at the end of the article. In the annuls of Okinawan Karate there are many great names that left their mark on the traditions and legends bound within our nightly practise of this fighting art. A history which stretches further back than the annexation of the Ryukyu Kingdom into Japanese hands, Karate long served the defensive needs of the indigenous population, post annexation this combative method migrated north and evolved into something new. In its new form the art would be used to inspire and prepare young men to carry out their duty for Emperor and Empire within the Japanese War Machine. During its transmission a number of notable masters and personalities migrated from Okinawa to Japan, particularly to Osaka and Tokyo to teach the willing student body. Men such as Funakoshi Gichen, Mubuni Kenwa, Miyagi Chojun and Uechi Kanbun all made their impact which is still celebrated today as notable branches of the Karate family. However one man in particular holds pride of place for “practical” minded Karate-ka, a man who in his own way collaborated in the forming of what we know as “Karate-do” but retained in his own teaching an “old” and “practical” vision of the art. Not without higher goals or evidence of deep philosophical consideration Motobu Choki kept his art within the realms of reality and focused on the goal of survival in a civilian conflict. Where his contemporise art worked for a higher goal of Zen like realisation and national development, Motobu primarily taught his students how to fight for their own personal safety. Possibly the greatest “practical” self-defence expert of those Okinawan master who migrated to Japan to teach Karate, Motobu has not shared the same world wide appeal as others, this is possibly due to a perceived lack of higher values, lack of support for his methods and possibly down to a negative campaign of propaganda placed against him during and after his life. Never the less due to the foresight of modern researchers such as Patrick McCarthy and Graham Noble, along with Motobu Choki’s son, Chosei, teaching his father’s methods internationally, this reservoir of combative knowledge is finally beginning to receive the acknowledgement that he deserves. 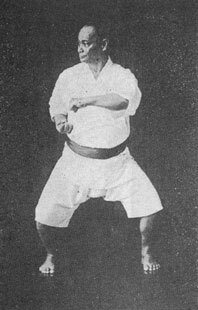 Part of Motobu’s legacy are 12 two person Kumite drills, contained within are the expressions of Motobu’s core combative values. Conveyed in Motobu’s 1926 publication “Okinawan Kempo” each one provides a lasting example of how this warrior viewed the realities of civilian conflict. Due to the importance to Karate’s history and in our own contemporary study, the aim of this work is to investigate what we can conceptually learn from the first of Motobu’s two-man drills. Choki Motobu was born between 1870 and 1871 and was the third son of Motobu Aji Choshin. Born within a royal lineage Motobu began training in martial arts around 12 years old under Ituso Anako. Due to Motobu’s heritage he was able to gain access to many other masters such as Matsomura Kosaku of Tomari village. Though it does not seem that he gained his combative abilities solely through training, Motobu was known to venture into Naha’s Tsuji-machi district. Essentially Naha’s red light district Motobu found himself in many “Kakedameshi” or in blunt terms, street fights. Often accused of starting these deliberately it is known that Motobu found himself on the winning side during these encounters. Motobu by his early 20’s had garnered a reputation for violence but possibly due to his rank within Okinawan society seems not to have felt the full brunt of the law for his actions. Indeed one story recounts that Motobu apprehended an escaped prisoner using his fighting ability. Moving to Japan later in his life Motobu opened up a dojo in Osaka and began to take on many students. Being part of that generation of masters who transported the Ryukyuan art to mainland Japan, Motobu found that his methods often attracted students of his contemporises which created great riverarly. In particular Motobu and Gichen Funakoshi had a heated riveraly, this situation between the politically shrewd Funakoshi and the blunt Motobu, might explain many of the negative myths surrounding this master as Funakoshi supports looked to discredit him. Though during his time Motobu took part in one of the most famous Karate incidents on the mainland of Japan. Around 50 years old Motobu, in a seemingly impromptu act, fought a western boxer as part of a Judo v Boxing compotation. After soundly defeating several Judo men Motobu stepped into the ring and defeated a much larger and younger man to the joy of the Japanese crowd. This incident sealed Motobu’s reputation as a great fighter, but through an independent spirit and lacking in the popularity of other Okinawan Karate masters, Motobu’s system gradually disappeared into the annuals of Karate history and his two publications, “Okinawan Kempo Karate-jutsu kumite” and “Watashi-no Karatejutsu”. Dying in 1944 Motobu left an everlasting effect on Karate which is still felt today. Published for prosperity in 1926 Motobu’s 12 Kumite drills provides a range of responses to physical violence. Each drill is a study in itself but the first drill in particular can provide an important base for which to understand his methods. We see both combatants start at an advanced distance, after formalities the attacker steps forward in a left front stance and strikes out with a left lead punch to the defenders head (Photo 1). Bridging the gap into a right lead stance (Nihanchi-dachi) the attacking arm is deflected with a rising block with the right arm the left hand is immediately driven and catches the attacker’s right hand (Photo 2). Feeling that the right hand is to be driven forward to attack, the defender pulls the attackers left arm back to his mid torso and delivers a lead right elbow to the attacker’s floating ribs (Photo 3). During his performance for Tsunami Video Chosei Motobu made it very clear that his father’s system emphasised the need to “get in close”. The opening movement epitomises this concept, where other Karate styles provide a retreating step in their two-man drills we see clearly an advancing step leaving the defender well within range to employ high impact weapons such as elbows and knees. We can assume from this that Motobu looked to condition himself and his students not to comply with their nature. Our “flinch” response would naturally lead us to retreat and turn away from the danger presented from an advancing strike, Motobu’s system instructs us not to shy away but advance into it. This is not tom foolery on his part, by undertaking this action we immediately cut off the opponents advancing momentum preventing being drowned by his wave of aggression, this action also “bridges the gap”, allowing the employment of high impact weapons to finish the fight. We can consider for a moment that the “bridging” concept may be a result of Motobu’s extensive training in Nihanchi Kata. In collusion with the bridging step Motobu employ’s his lead forearm to rise above his head, dropping his centre by bending his knees, the attacking arm is deflected above him opening the attacker’s vulnerable torso for counter attack. But as in other systems where the other hand is left on the hip in a “chambering” position, Motobu’s system instructs us that the other hand must be employed and become active when this close. Motobu referred to this as “Husband and Wife Hands”, referring to how both limbs had to work together in a civilian encounter. This is vitally important and recognises that in a “real fight” punches don’t come in one “oya-zuki” after the other allowing for a series of defending responses. Working in conjunction with the “bridging step” the hands smother the attacker’s limbs limiting further attack. A further interesting point to note is that in some sources using a “rising block” was a common tool employed by those from Tomari to open an opponent up. As Motobu was a student of Kosaku Matsumora we might see here a fundamental Tomari strategy in play. As we have discussed the opening step and the hands, it is important to look at the stance. Motobu was famous within Karate circles for his performance of Naihanchi Kata. Forming a fundamental form for people trained within the Matsumura/Ituso lineage, Naihanchi became the backbone of Motobu’s system. The manifestation of the stance is not strictly the Naihanchi stance as the feet are angled to allow forward movement, but what is retained is the essence. Maintaining the weight within the centre of the body, his stance provides a flexible but stable base allowing his upper torso to freely move to apply his physical responses. Motobu does not over commit his weight in any direction allowing for rapid movement to be employed when required. Before the great Bruce Lee taught his own students to strike an opponent with their closest weapon to his closest target, Choki Motobu was instructing his students to employ their lead hand as a primary tool in civilian encounters. In a time when the lead had was used to defend and the rear to attack Motobu did not bound his limbs in these rigid roles. Motobu in this Kumite drills teaches that the lead arm can be used to deflect as well as to strike all within the same attack. Once the attacking arm has been deflected and the other smothered and controlled, Motobu delivers a devastating strike using his lead elbow to his opponent’s ribs. Interestingly if we look at the completed position the elbows are very reminisant of Nihanchi Nidan which Motobu also practised. We are forever indebted to that generation of masters who, on taking the vision of Ituso Anko of an art no longer hidden in the dark , dedicated their lives to spreading this combative theology to the masses and on embracing new printing technology, wrote their knowledge down. However much of the writing was in support of a version of the art suited to a new world where their little unknown system had to find a place in a society which already had a rich and varied combative culture. This meant that much of the writing of the time still did not fully provide the true extent of the art and often left its combative explanations in an unrealistic world. Adhering to some of the ritualised markings of the art, Motobu’s kumite drills provide practical responses and teachings in response to physical violence. Motobu through hundreds of fights understood the differences between a “real” fight and a ring contest. Through this experience and a deep understanding of Karate, Motobu was able to blend the concepts handed down through Kata and portray it in a tangible way providing a realm of “realism” compared to the rest of his contemporises. A reality we can still learn from today.